David’s mother, Mary Parish had previously married Noah Robert Grey in 1884 in Preston. They had a daughter Minnie Grey in 1890. Noah Roberts died in 1893 age 34. Two years later, Mary remarried. George & Mary Winton (formerly Grey, nee Parish) married in St. Deniol’s Church in Hawarden in 1895. Their son, David Winton was born in the September Qtr of 1895. 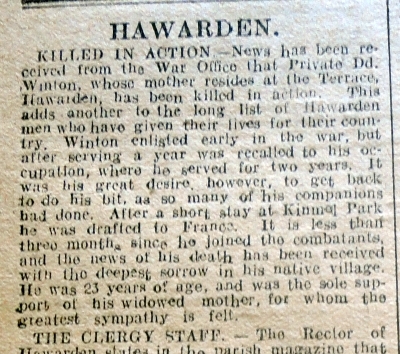 His birth was registered in Hawarden (HAW/41/84). David is on the 1901 census age 5, living with his family at Station View, Hawarden. George Winton 45, a Boilermaker was head of the household. His wife Mary Winton, was 43. Her daughter, Minnie Grey was 11. A Boarder, Ellen C Harris ( Helen Caroline Harris) was 41 and had learning difficulties but in those ‘enlightened times’ she was described on censuses as an ” Imbecile from childhood” (1891, 1901 and 1911). George Winton died in 1908. The 1911 census records the family living at South Terrace, Hawarden. Head of the household was Mary Winton, 53 and a widow. Her son David Winton, was 15 and a Labourer at the Ironworks. Mary’s daughter from her 1st marriage, Minnie, had married Walter Durham in 1909 and they were listed in the household. They had been married for 2 years. Minnie Durham, 21 had borne 2 children, of whom 1 had died. Their surviving son Norman Stanley Durham was 1. Helen C. Harris, 47, was listed as a Boarder who had been born in London and was described as “Feeble Minded”. UK, Soldiers Died in the Great War, 1914-1919 accessible on www.ancestry.co.uk confirms that his regiment had been the 13th Bn of The Royal Welsh Fusiliers and that his number was 241012. His death date on this source is 1st September 1918. His medal card also on ‘Ancestry’ lists the Victory and The British War medals. David’s Army Service Records have survived and are accessible on www.ancestry.co.uk. They are a bit scrappy and confusing but tell some of his story. He enlisted on the 9th March 1915. He gave his address as The Terrace Hawarden. His occupation was ‘Labourer . His religion was Cof E. He was medically examined at the time and the report tells us that he was 19 years and 7 months old, was 5 feet 10 and a half inches tall and had a chest measurement of 33 inches with a 1 inch range of expansion. His vision and physical development were good and he was deemed fit enough to serve in the Territorial Force. He was appointed to the 2/5th Bn of The Royal Welsh Fusiliers and was given the regimental Number 3035. Mary Winton, his mother was named as David’s next of Kin. The records show that in 1915 he spent time with the regiment in Aberystwyth and then in Northampton and Bedford. Whilst in Bedford he got into a spot of bother as on the 3rd November 1915, he attempted to quit the C.O.’s parade without permission. For that he was ‘Confined to Barracks’ for 14 days. On the 9th March 1916 he was transferred to the Army Reserve and was attached for duty to Messers Sandycroft Ironfounders Ltd. Presumably he stayed there working as a Forgeman’s helper until he was recalled from the reserve to rejoin the regiment on the 8th April 1918. Before he went to France as part of the British Expeditionary Force, he spent some time in Kinmel Park where once again he got into trouble. On the 15th June 1918 he went missing and stayed away for for 59 hours and for his trouble was once again ‘Confined to Barracks’ this time for 10 days and he lost some pay. He was obviously a bit of a character. He joined the British Expeditionary Force in France and reported to the Base Depot on the 14th August 1918. The dates in the records become very confused and confusing at this point. He was transferred to the 13th Bn of the RWF on the 26th August 1918 and yet on another paper was reported dead on the 23rd August 1918. There is correspondence in the Records between David’s mother and the army. These concerned the receipt of his possessions, medals, a commemorative plaque and scroll and a scroll and message from the King. Mary completed an Army relatives Form naming herself and her daughter Minnie. Conversations about this soldier took place on The Great War Forum. The following account of what was happening to the 13th Bn at the time was sent to me by Ken – for which I am very grateful. In ‘The War the Infantry Knew” J.C. Dunn who was serving in the 2nd Bn RWF (115th Brigade 38th (Welsh) Division) describes the period from the 15th August 1918 as a ‘tremendously busy time’. Winton joined 13th Bn (113th Brigade 38th (Welsh) Division) around this time. From the 15th the Division was preparing for a major action, on the 22nd the 113th Brigade was crossing the River Ancre near Albert and a period of intense fighting continued until September 5th when the 38th Division was relieved by the 21st. On the 1st September the Division took Morval where Winton is buried, and according to the CWGC cemetery notes all the casualties interred there date from the 26th August to the 6th September. From the 23rd August to the 6th September (actually the 4th) the 13th Bn suffered 114 dead with 24 on on the 23rd. Only 8 of the casualties in the cemetery are RWF and all bar one were from the 13th Bn. While his death certificate may be the document of record I’m not sure the CWGC Roll of Honour can be reconciled with the record. There was heavy fighting on both dates, Dunn himself was wounded on the 1st September and interestingly he comments on two officers who were attached from a Lancashire Regiment who became casualties that day noting, “they were such recent arrivals their particulars had not been taken by the Company”. Many of the casualties from the Division during this period have no known grave and are recorded on the Vis-en-Artois Memorial, at least Pte Winton’s family had that comfort though his time at the Front was so short. Many thanks to Ken and to others on the forum for their help in understanding this story. In memory of/ my beloved son Pte DAVID WINTON/ died of wounds in Merval, France/ Sep 10 1918, aged 23 years/ O Lord let thy perpetual light/ shine upon him. This is another twist to the date of David’s death, the inscription on the family grave.